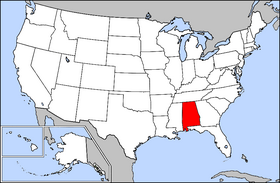 Alabama is a southern state located in the southern United States; the population of Alabama is 4,447,100 as of 2000. USS Alabama was named in honor of this state. Among Native American people once living in present Alabama were Alabama (Alibamu), Cherokee, Chickasaw, Choctaw, Creek, Koasati, and Mobile. Alabama was once a region claimed by the Spaniards as part of Florida. The English also claimed it as part of the province of Carolina. Nevertheless, when the French took over Louisiana they also took over the territory including Alabama. Later when the United States acquired the Louisiana Purchase and the Mississippi Territory, there was much controversy as to whether or not Alabama was included. Nevertheless, Alabama became the 22nd state in 1819. The state of Alabama seceded from the Union and became a Confederate state on January 11, 1861. While not many battles were fought in the state, it contributed about 120,000 soldiers to the Civil War. After the war a provisional government was set up in 1865 and Alabama was readmitted to the Union in June 1868. 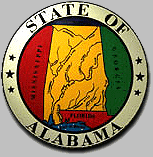 Alabama is the 30th largest state in the United States with 135,765 km2 (52,419 mi2) of total area. 3.2% of that is water, making Alabama 23rd in the amount of surface water. About three-fifths of the land area is a gentle plain with a general incline towards the Mississippi River and the Gulf of Mexico. Alabama generally ranges in elevation from sea level at Mobile Bay, to a little more than 1800 feet or 550 meters near the Georgia state line. The highest point is Mount Cheaha (pronounced like "chee-ha") at 2704 feet or 734 meters. The 1999 total gross state product was $115 billion placing Alabama 25th in the nation. The Per Capita Income for the state was $23,471 in 2000. Alabama's agricultural outputs are poultry and eggs, cattle, nursery stock, peanuts, cotton, vegetables, milk, and soybeans. Its industrial outputs are paper, lumber and wood products, mining, rubber and plastic products, transportation equipment and apparel.